New Information: The Secretariat received from various sources, including the press and visitors, eye-witness accounts on the demolition of traditional buildings in the Shol (administrative district of the Potala Palace) which forms part of the World Heritage protected area inscribed in 1994. According to these reports, on-going demolition is not limited to post-1959 additions to the traditional buildings but also includes original buildings that are important to the historic understanding of the Shol area in its relation to the Potala Palace. The beautification of the more prominent buildings for conversion into souvenir shops and art galleries, as well as clearing of land for a green zone within Shol are reportedly being carried out by expulsing the inhabitants and demolition of the homes in order to develop tourism facilities. The Bureau notes the efforts being made by the national and local authorities in promoting public awareness for the use of traditional building material and conservation methods to preserve the original architectural features of the site, as reported to the twenty-third session of the World Heritage Bureau. The Bureau however, expresses concern over reports on the transformation of the historic characteristics of Shol, the former administrative area whose history is inseparable from the Potala Palace. Whilst recognizing the importance of tourism and the need for adequate facilities for visitors, the Bureau requests the State Party to maintain the authenticity of the area and provide a report on the renovation plan of Shol to the Secretariat by 15 September 2000 for examination by the twenty-fourth extraordinary session of the Bureau. The Bureau, at its twenty-fourth session, requested the State Party to maintain the authenticity of the area and provide a report on the conservation plan of Shöl to the Secretariat by 15 September 2000 for examination by the twenty-fourth extraordinary session of the Bureau. The Secretariat received, on 25 September 2000, a Report on the Protection of the Shöl Area under the Hill of the Potala Palace and related Plans prepared by the State Administration of Culture Heritage of China. The Report was transmitted to ICOMOS for review and comments. The Secretariat was informed that the local authorities terminated the activities of the Tibet Heritage Fund, a NGO supported by several European governments working in Lhasa for the conservation of traditional building in the Barkhor area surrounding the Jokhang Temple. 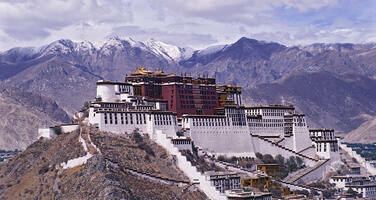 This area is proposed as an extension to the World Heritage site of the Potala Palace. The report submitted by the Government of China stated that “according to reports from the Cultural Heritage Bureau of the Tibet Autonomous Region (TAR), there were schemes to demolish ancient buildings or set up tourist facilities at the Shöl Area by non-cultural heritage organisation or individuals. However, the Cultural Heritage Bureau of Tibet, the competent authority of TAR, has stopped all the projects. The future plan for the area is to move out the residents who are not original dwellers of the area, so as to better reserve the traditional buildings in their true and integrate conditions. It was also learned that the Tibetan Archives, with financial support from a foreign non-government institution, the Tibet Heritage Fund, has started the restoration of the ruins of an ancient building without the permission from the competent culture heritage authorities, which is now making investigations and settlement." Furthermore, the Secretariat was informed that the protection area of the Potala Palace has been redefined according to the “Measures on the Protection and Management of the Potala Palace” issued by the No 10 Order of the People’s Government of the Tibet Autonomous Region. The protection area circled by the surroundings walls is the core area as well as the Northeast Corner of the Red Hill where the Potala Palace stands. The buffer zone is clearly indicated on a Map attached to the report. The Secretariat informed the Bureau that information from various sources was received concerning the on-going demolition of the traditional buildings in the Shöl area (administrative district of the Potala Palace) which forms part of the World Heritage protected area inscribed in 1994. The beautification of the more prominent buildings, as with many other historic areas in Asia, for conversion into souvenir shops and tourism facilities, was leading to the decrease of residential use and undermining the authenticity of the site. The Bureau noted the efforts being made by the national and local authorities in promoting public awareness for the use of traditional building material and conservation methods to preserve the original architectural features of the site, as reported to the twenty-third session of the Bureau. The Bureau however, expressed concern over reports on the transformation of the historic characteristics of the Shöl area, the former administrative area whose history is inseparable from the Potala Palace. Whilst recognizing the importance of tourism and the need for adequate facilities for visitors, the Bureau requested the State Party to maintain the authenticity of the area and provide a report on the renovation plan of Shöl to the Secretariat by 15 September 2000 for examination by the twenty-fourth extraordinary session of the Bureau. The Committee decided to approve the extension of the inscribed property of the Potala Palace to include the Jokhang Temple Monastery. The Committee decided to retain the name of the city (Lhasa) in the name of the property. The Bureau may wish to examine the information provided above and request the State Party for clarifications regarding the government policy on the involvement of international NGOs, multilateral and bilateral development co-operation agencies in the conservation of cultural heritage in Lhasa.